“Rather than reacting to the bad behavior, I think we need to be more forward-leaning as it relates to what the consequences will be,” Bush said. The remarks were part of Bush’s ongoing efforts to pitch an aggressive foreign policy as he struggles to break out of a crowded Republican presidential primary in which businessman and former television reality star Donald Trump has garnered much of the attention. Yet for Bush, the discussion comes with particular challenges as he tries to distance himself from former President George W. Bush, the candidate’s brother, who signed the Patriot Act into law and oversaw the 2003 invasion of Iraq. 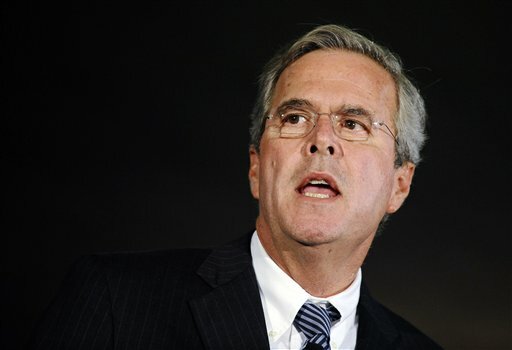 Bush doubled-down Tuesday on his assertions that there is “no evidence” the data collection violated civil liberties. “I’ve found not one” case, he said. The Privacy and Civil Liberties Oversight Board, an independent bipartisan agency, declared NSA’s phone records collections program illegal in 2014, and a federal court of appeals reached the same conclusion earlier this year. A May analysis from the Justice Department found that FBI agents interviewed by the inspector general’s office “did not identify any major case developments” that came from using Section 215 that allowed the bulk records collection. Bush also criticized private technology firms for using encryption to make it harder for their customers to be surveilled. “It makes it harder for the American government to do its job while protecting civil liberties to make sure evildoers aren’t in our midst,” he said. Bush also opposed Trump’s idea of a fence or wall along the border. “It’s not realistic to create a fence in places where fences can’t be built. You’d have people, American citizens, on the south side of the fence in some places. Or they’re on the wrong side of the fence,” Bush said. When it is the government themselves that are the “evildoers” granting them more power to do their own thing is not exactly helpful. However, since he and his family have been leeching from the public purse for several decades now, it’s not entirely surprising that he sees government as ‘the good guys’, whatever evidence arises to the contrary.